Engineering equipment firm Weir Group has reported a 21% drop in pre-tax profits to £170m last year. Much of the Glasgow-based firm's operations are in US dollars, and without the weaker pound, the constant currency decline would have been 31%. Revenue dropped 2% to £1845m, though that was an 11% drop without the help of currency fluctuation. Weir said the downturn in the oil, gas and commodities markets was the worst it had seen in more than 30 years. Its report cited the drop in capital spending by mining companies of 50% since 2012. The number of rigs used for fracking in onshore US oil and gas fields had fallen 80% in only two years. However, it said commodity prices rose during last year, and trading conditions improved towards the end of 2016. There were also signs of more activity in US onshore oil and gas towards the end of the year. 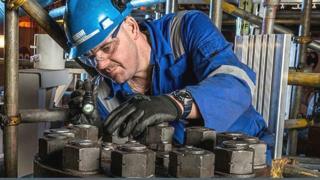 The new chief executive of Weir Group, Jon Stanton, said: "Following a challenging and prolonged downturn, the group returned to growth in the fourth quarter of 2016 as our main markets showed signs of improvement and we benefited from our on-going investment in new technology and long-term customer relationships".